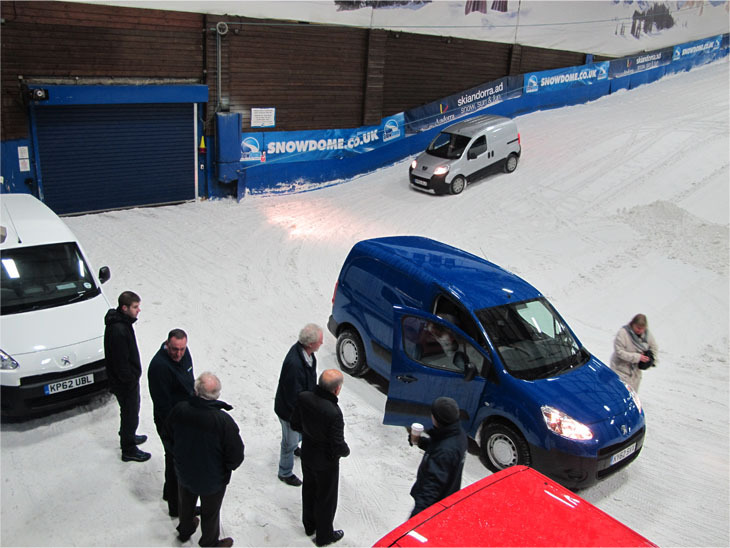 A quick glance at the picture and you'd think the location for the launch of the new Peugeot Bipper ATV small van took place somewhere in the Swiss or Austrian Alps. It wasn't. It was in Birmingham! 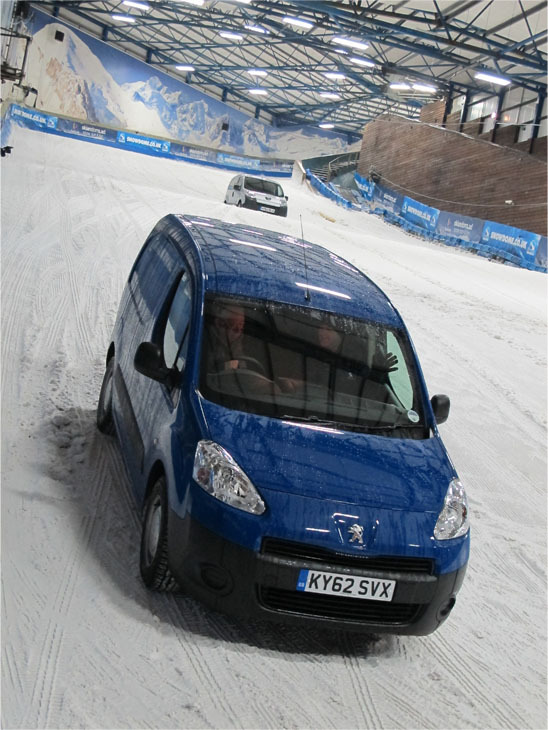 The location was the Birmingham SnowDome at Tamworth and Peugeot had the inspired idea of showcasing their new 'ATV' system on the artificial ski slope. 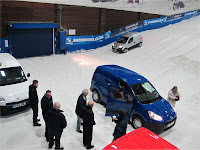 Saturday had been spent at MIRA Proving Ground just outside Birmingham where the UK's top LCV journalists (and me) drove the new enhanced traction Bipper on a variety of paved and wet surfaces to demonstrate the extra grip that this electronic system provides over the standard van. There is no LSD in the transmission, the big surprise is that the improved levels of two-wheel drive grip come from an electronically controlled traction control system which determines how much slip and grip to be sent to each driven wheel. The result is mighty impressive. Even when straddling two different water-soaked surfaces in the braking and acceleration area at MIRA, control was maintained at all times. Then on Sunday morning, before the SnowDome ski-slope opened to the public, Peugeot hosted their indoor snowbound adventure. A bog standard Bipper van couldn't get ten feet up the slope without wheel-spinning helplessly to a halt and sliding backwards, but the ATV vans could get all the way to to the top of the 170 metre ski slope. Well some of the vans could. 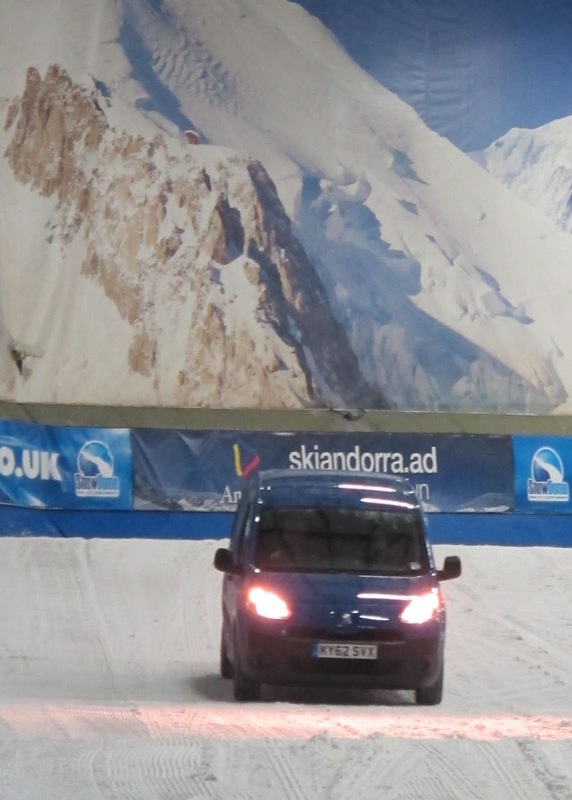 Initially, all the vans got stuck at the two thirds mark where the snow was deepest until one enterprising journalist spotted a new route to the left of the slope instead of the right, and made it all the way to the top. Now I wonder who that could have been! Impressive stuff, but I wonder how the system would transfer to a rally car! We also got the chance to drive another brand new Peugeot product, but I can't tell you anything about it. It's a secret, till next month. There's an embargo on the news!